What are the various location data values in the record metadata? Describing the location, created location, and updated location values. There can be three location values that are captured and stored in a record within Fulcrum, the location, created location, and updated location values. The location value is the record's actual location. This is where the record is located on a map. If the location was captured by a GPS on the mobile apps then you will see accuracy metadata to the right of the coordinates (not pictured above). If you do not see any accuracy metadata, then it is a good indicator that the location of the record was manually set. The created location is the location of the mobile device when the record was initially created. This information is provided as a way for administrators to see where the user was actually located when the record was created. You will see the accuracy data metadata and then the distance between the record's location and the location that the device was at when the record was created. The updated location is the location of the mobile device when the record was lasted updated. This information is provided as a way for administrators to see where the user was actually located when the record was last updated. You will see the accuracy data metadata and then the distance between the record's location and the location that the device was at when the record was last updated. Location accuracy is only provided it the GPS was used to capture the location data. Manually setting or editing the location will not provide any accuracy data. 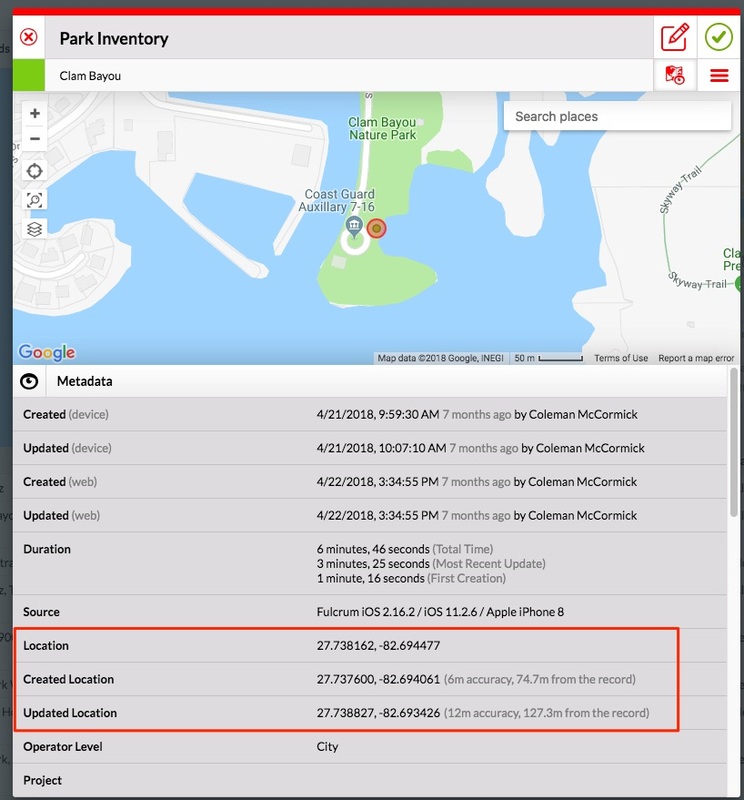 Creating or editing the record on the web app will result in the created/updated location data in not being provided. Only the mobile apps will return this data. If your data was collected in Fulcrum a long time ago, it may have been collected before the created/updated location data was added to Fulcrum.